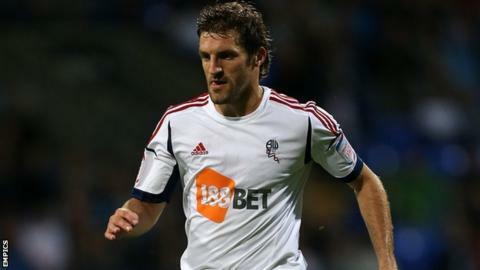 Relegated Wolves have made their first signing of the summer by bringing in experienced Bolton Wanderers defender Sam Ricketts on a free transfer. The 31-year-old, capped 48 times by Wales, has signed a two-year deal - and been named Wolves' new captain - after his contract at Bolton was cancelled. "Sam's been a good servant," Trotters boss Dougie Freedman told BBC Sport. "But I just can't honestly look him in the eye and guarantee him a position in the team," added the ex-Wolves striker. Ricketts' place at Bolton was under threat following the signing of fellow defender Alex Baptiste from Championship rivals Blackpool last week. He is the first signing made by new Wolves head coach Kenny Jackett, who first signed him for Swansea City from non-league Telford nine years ago. "I know Kenny from working under him at Swansea," said Ricketts. "He signed me from Telford and I had two great years with him. We got promoted the first year and narrowly missed out the second. "First and foremost, he is a nice guy which goes a long way nowadays. There aren't all that many nice managers about and he earns respect from that. He is a calm character who gets teams very well organised and has a proven track record. "Dropping down a division doesn't put me off at all, because of the size of the club. Wolves are not a club looking to stay in League One." The move for Aylesbury-born Ricketts, who joins up with two other Welsh international team-mates, fit-again Wolves keeper Wayne Hennessey and midfielder Dave Edwards, counters the flow of transfer activity at Molineux. Keeper Dorus De Vries has signed for Nottingham Forest, winger Bakary Sako is a reported target for Fulham, and there are impending moves for the Wolves' transfer-listed quartet of Jamie O'Hara and three former captains, Karl Henry, Roger Johnson and Stephen Ward.